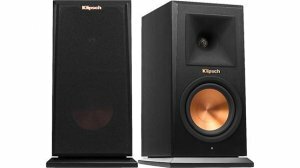 Klipsch RP-140WM Reference Premiere HD Wireless Wireless bookshelf speakers (black)(pair) Klipsch RP-140WM Reference Premiere HD Wireless Wireless bookshelf speakers (black)(pair) - $799.99 : New Audio & Video, New Electronics at Lowest Prices! High-Resolution Wireless Bookshelf Loudspeaker: The Klipsch RP-140WM high-resolution bookshelf loudspeaker is part of the Klipsch Reference Premiere HD Wireless speaker system. The Klipsch RP-140WM combines WiSa wireless speaker & audio technology with Klipsch's legendary audio & system design expertise for a high-performance wireless speaker. Two-Way Driver System: The Klipsch RP-140WM high-resolution bookshelf loudspeaker utilizes a two-way driver design with a 1" Titanium LTS tweeter mated to a 90°x90° Hybrid Tractrix Horn and a 4.5" Cerametallic cone woofer with rubber surround for detailed, dynamic sound. The speaker employs a 1.8kHz crossover to distribute the high frequencies to the tweeter and lowe frequencies to the woofer. 90°x90° Hybrid Tractrix Horn: A redesigned Tractrix Horn utilizes a circular horn throat paired to a square horn mouth to further improve high-frequency response and extension, while enhancing imaging and dynamics. The compressed molded rubber construction adds high frequency damping to reduce harshness and improve detail. This creates the cleanest, most natural sound possible. These 90° x 90° Hybrid Tractrix Horns provide a wider sweet spot while maintaining controlled directivity of the sound. 1" Titanium LTS Tweeters: Behind the Tractrix Horn lies a 1" titanium tweeter with a linear travel suspension for open, natural, sound. The Linear Travel Suspension minimizes distortion for enhanced, detailed performance. 4.5" Cerametallic Woofer The 4.5" woofer of the RP-140WM bookshelf loudspeaker features Klipsch's distinctive, copper-colored Cerametallic material. Made with an anodized aluminum, this cone is strong and dent resistant. The anodizing process converts its inner and outer surfaces to ceramic. The outcome is a rigid cone with superb damping characteristics that will not flex or resonate at frequencies within the woofer's operating range The 4.5" woofer also employ a rubber surround for added durability. Bass Reflex MDF Enclosure: The Klipsch RP-140WM employs a bass reflex enclosure with a rear-firing Tractrix port for greater efficiency and bigger bass response. Utilizing Tractrix geometry, the all new redesigned bass port allows for the most efficient, fastest air transfer from the cabinet for a clean, powerful low frequency response. The ported enclosure features a MDF cabinet finished with a premium wood-grain polymer veneer and a polymer front baffle. The speaker's rigid cabinet offers improved internal cross-bracing to minimize panel vibrations that can color sound. MDF Plinth: The all new satin painted MDF plinth footers of the Klipsch Reference Premiere HD Wireless bookshelf speaker lends an acoustically sound, authoritative stance when placing the speakers on a tabletop, shelf, or stand. Pre-installed rubber feet add extra stability (there are no threaded inserts or keyhole slots for wall-mounting). Magnetic Grille: The wireless bookshelf loudspeaker features a removable magnetic low-diffraction grille which easily snaps into place over its polymer front baffle. Requires HD Wireless Control Center: The Klipsch Reference Premiere HD Wireless System requires at least two RP-440WF floorstanding speakers or two RP-140WM bookshelf speakers, plus the Klipsch RP-HUB1 HD Control Center (sold separately). The Klipsch HD Control Center replaces complicated AV receivers and transmits audio wirelessly to the Reference Premiere HD Wireless System's speakers. The HD Control Center creates its own dedicated WiSa (Wireless Speaker & Audio) network independent of your home WiFi to eliminate dropouts and interference caused by bandwidth constraints within your home. Note: These speakers have no speaker wire terminals on the back-panel to connect to a typical AV receiver. Instead, they have a built-in wireless receiver that functions only with the Klipsch RP-HUB1 HD Control Center (sold separately). The only hardwired connection the speakers will need is AC power via the included detachable AC power cords. High Res 2.0-7.1ch Audio: The Klipsch Reference Premiere HD Wireless System can deliver 24-bit/96kHz audio in configurations ranging from 2ch stereo to 7.1ch surround sound, supporting both Dolby Digital Plus (7.1ch) & DTS (5.1ch). The RP-140WM bookshelf speakers are ideal for a simple 2ch stereo setup. They can also be used as front, surround, and/or surround back speakers in a home theater application. Simple Setup: The Klipsch Reference Premiere HD Wireless System gives you the ability to place speakers anywhere in your room without running speaker wire through walls or under carpet. Klipsch's proprietary Smart Speaker Selector provides a single-button solution on the rear of each speaker that seamlessly makes the connection to the HD Control Center without the need for speaker wire or a complicated AV receiver. Firmware & Software Updates: Once you register the Klipsch Reference Premiere HD Wireless System, Klipsch will offer free firmware & software upgrades which can be downloaded from their website, so you can stay current with the latest Klipsch technologies while expanding your system over time. AC Power + Auto On/Off: The Klipsch RP-140WM high-resolution bookshelf loudspeaker will need to be plugged into an AC power outlet, along with any other Klipsch Reference Premiere HD Wireless speakers you have in your system. The RP-140WM will turn on automatically when it senses a wireless audio signal and turn off (standby) automatically when there is no audio signal present. The speakers are exceptionally efficient whether they are on or in standby mode.